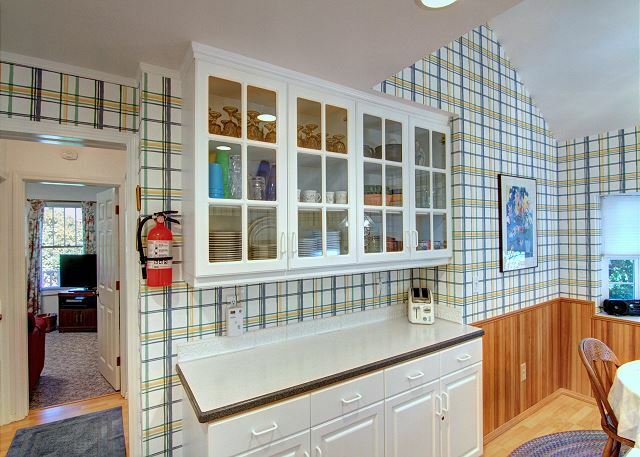 Located in the heart of Cannon Beach, the McRae House oozes nostalgic beach-bungalow charm while providing contemporary convenience. This corner property, with outstanding landscaping and garden area, is tucked within one of the most desirable Presidential blocks only minutes from downtown and the beach. The front porch invites you into the spacious living room featuring a gas fireplace, and the adjoining dining area. Enjoy leisurely meals while gazing out onto the peaceful yard and garden. Close to the entry and just off the living room, the cozy den provides a quiet space for entertainment with a flat-screen TV, including a VCR and DVD player. The den sofa opens into a hide-a-bed. 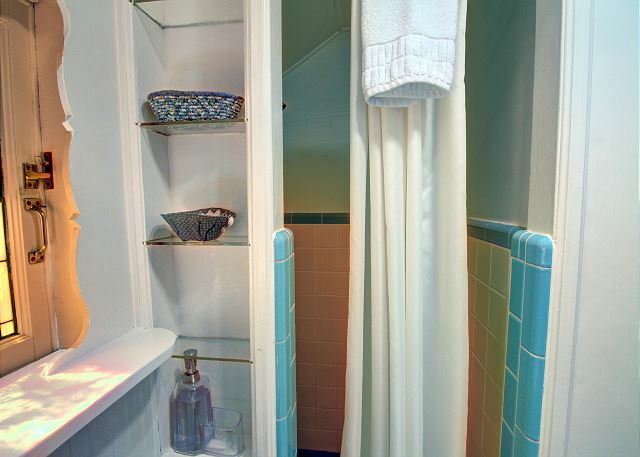 An additional doorway from the den opens into a hallway conjoining a bedroom with a Queen bed, a bathroom with tub and shower, and a laundry area with stackable washer and dryer, as well as a large soaking tub. 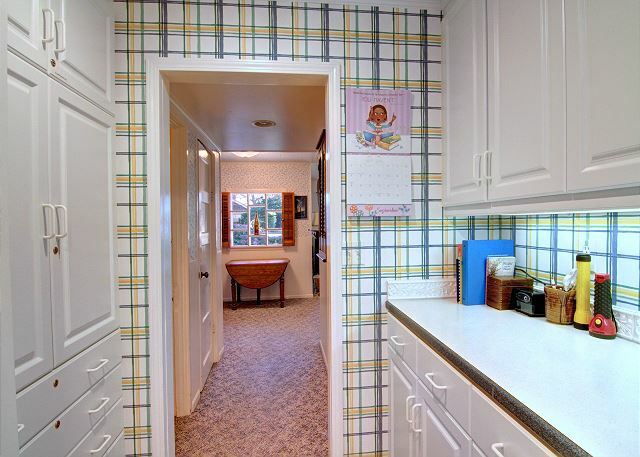 This hallway also flows through the sunny kitchen and returns back into the dining and living areas. Enjoy breakfast in the nook area with seating for six, while keeping up with the latest news on the flat-screen TV with DVD player. 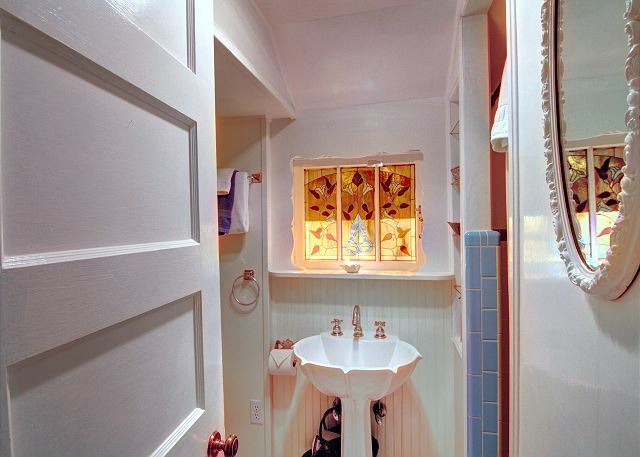 From the other end of the kitchen, a quaint second bathroom with shower features a nostalgic pedestal sink and stained glass window. 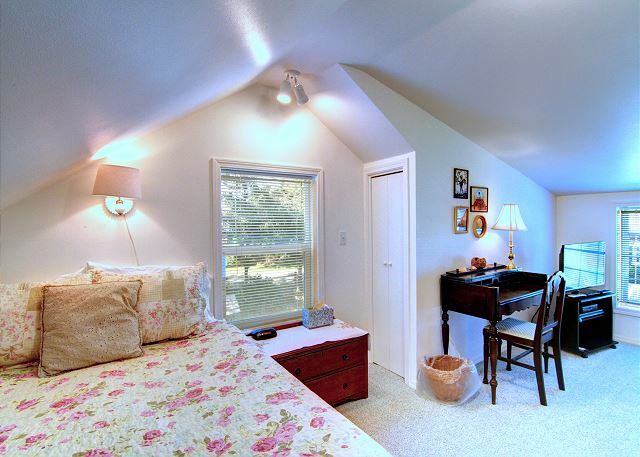 The delightful and cozy upstairs features two bedrooms. 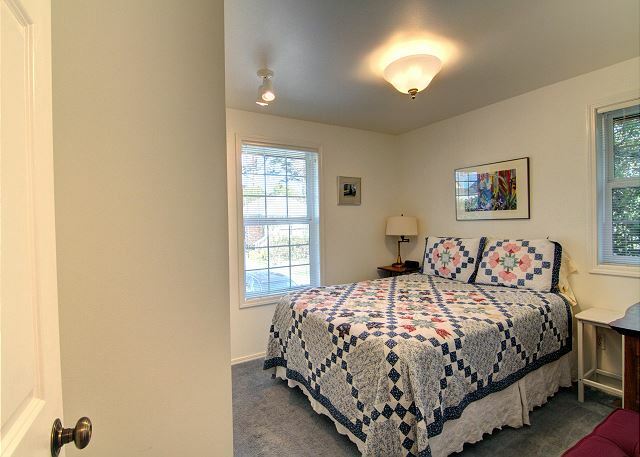 One bedroom provides a Queen sized bed, a Twin daybed, and features another flat panel TV with DVD player. The second bedroom has two Twin beds. Off the front porch, the garage houses a gas barbecue and plenty of beach chairs. After a full day in town or on the beach, be sure to enjoy leisurely evenings on the porch or in the garden. 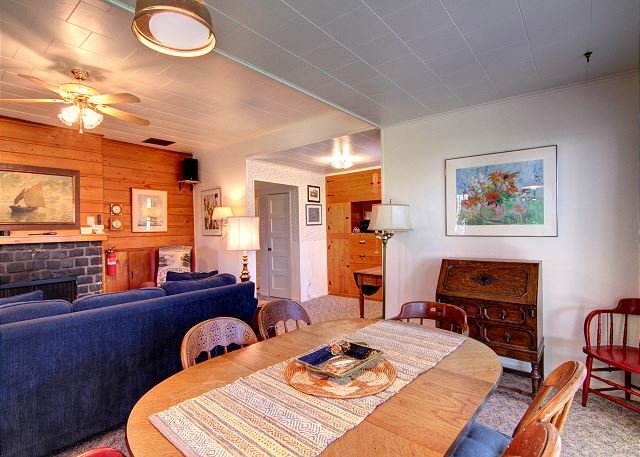 This is an adorable family vacation home, sure to create joyous memories. Accommodates 6 maximum; no pets; no smoking; parking for 3 vehicles. "There was no negative experience. The best time ever. The house was amazing. Better than we ever expected. " "Our family enjoyed many of the games that were available in the house. Our stay was short this time and we were thankful that the McRae House was available for us. I am sure given a longer time that we would enjoyed the TV, VCR, etc. devices that are in the house. Fireplace would have helped make it 'exceptional'." "The McRae house location is perfect." "The location of this rental was perfect for our purposes, and surprisingly the weather was much better than forecasted. We could have stayed longer." "Fully stocked kitchen, fantastic lighting in kitchen, lots of beach chairs for our use, excellent location. " "Location of house - close to beach and downtown. " 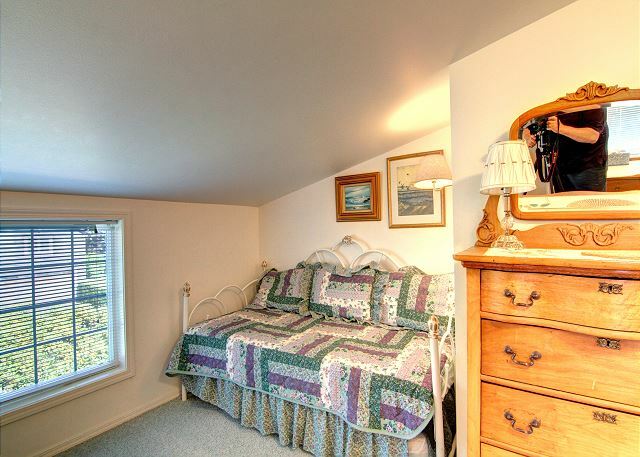 "Home was in a great location- close to beach by Haystack Rock, town and shops." "A group of friends came to Cannon Beach for a women retreat at the Christian Conference Center. The McRae House was a lovely walk to the center. The house was very clean, comfortable and well stocked." "quiet, quaint, and lovely. We would definitely stay again. Would have loved to sit in the yard on a couple of chairs. " "We could not have asked for a more beautiful location. The yard with all the flowers was just gorgeous. Only a few steps to the beach. Beds were very comfortable and there was plenty of room for all." "McRae House is very comfortable and has a well equipped kitchen. 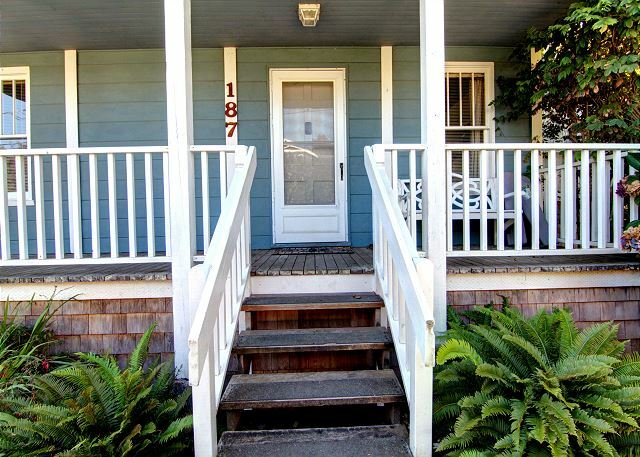 it is an easy walk to the beach and to downtown Cannon Beach." "We again had our children and grand children for a week stay. fun an sun for all. " "Great house. Two blocks from beach access which is steep with deep sand." "great house- a bit antiquated which had charm. perhaps a few less collectables and "table coverings" would lend to a less cluttered feel. "Our family of five enjoyed 5 days at Mcrae House. It was a cozy and comfortable house with all the amenities one could hope for.The owners are obviously very proud of this house and enjoy sharing it with others.How fortunate for us! We will definitely stay here again. " "The house was cozy, clean and inviting. Very close to the beach and shops downtown. Beds were all comfortable. Would recommend this home. " "I loved the McRae house. It is such a beautiful example of an historic beach cottage. It is beautifully redone inside with the perfect touches to keep its original look and atmosphere. It was my dream of a cottage by the sea. We were very comfortable. (Stairs going upstairs are very steep but there is a bedroom downstairs for those who need it.)" "Again, we all had a great stay. We have reserved it again for next summer." 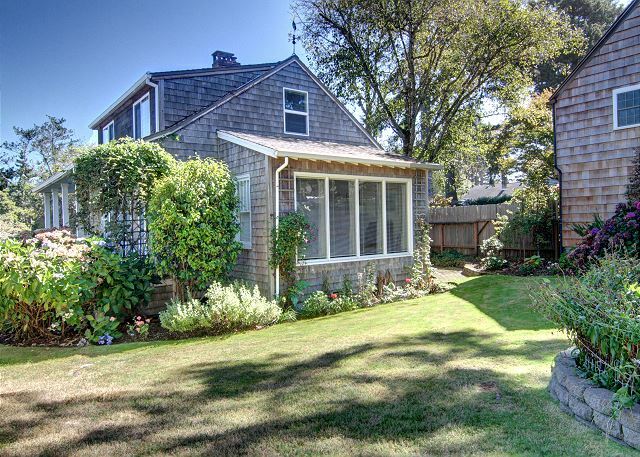 "Just about a half a block from the ocean! I especially liked the magical side yard with the little well and very nice, green lawn. Plenty of room to spread out, and a good point to mention concerning the house was one could talk in the rooms and not hear conversations upstairs. My family really loves the location as one is able to easily walk to shops and restaurants and very close access to 101. If you have children or someone who may be physically challenged, plan for them to stay in bedroom on lower floor as the stairs are steep going upstairs. 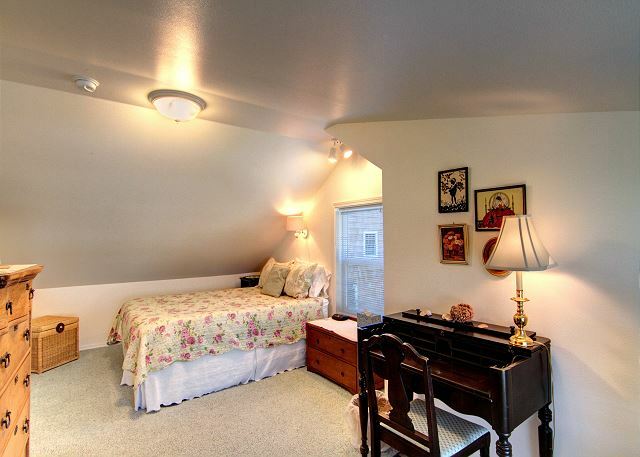 The upstairs was quiet and the main bedroom upstairs had nice windows to allow air to circulate. You won't be disappointed!" "The house and location was great enjoyed the stay." Cannon Beach. The location is perfect. 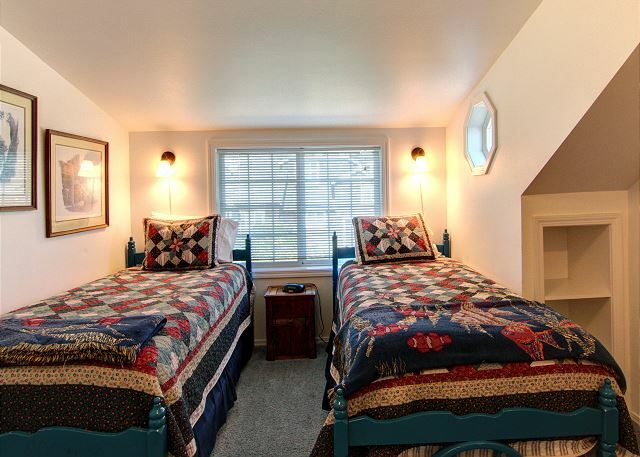 It is a short walk to the beach and very convenient to the main street. The home is well furnished with everything you may need. Our only concern was for our older guests that had to climb the stairs to sleep with no upstairs bathroom. We enjoyed our stay." "Looks like we have a family tradition established after the past 3 years. Assume we will re-up next year when we arrive. second exit only thru basement- two flights of stairs a hall, a door to garage and the garage door. it felt UNSAFE with out a second easily accessible exit. fire place remote did not work.. kitchen well supplied with equipment and dishes, utensils, good lighting and lots of counter space. grill surface worn but usable. fold out couch was a major headache and wasted a lot of time. Loved the location for downtown access. Nice enough place but no desire to return." "Our family spent the first of what we plan to be an annual event at the McRae House in Cannon Beach - and it was wonderful! We couldn't have been in a better location with the beach a bare 1/2 block away and restaurants/shopping a block the other direction! House was very well maintained and provided plenty of stretching out room for our multi-generational family. It would have been nice if our family movie night could have taken place in the very spacious living room but the only TVs were located in kitchen and smaller tv/guest room - a little odd but overall a great place for enjoying all that this part of the Oregon Coast can provide. We would definitely consider this house again for our next visit." "Great place for a family or group getaway. Kitchen is very well stocked, the entire home is cozy and welcoming." "We were in town for a short weekend and were pleased with the rental. It comfortably slept 3 couples and had great kitchen space for cooking. The location to the downtown area was great. We would certainly rent this space again. " "We've stayed here before and usually ask for it if it's available. One of our favorite rental houses. Very comfortable with lots of places to disappear. Plus wi-fi!!! (A note to other owners, it's nice to be able to have 4 laptops and 4 smartphones connect to wi-fi - an increasingly more important requirement. We no longer stay in a places without wi-fi.)" "I have lived in the Northwest for 20 years and been to the beach many times, but we never stayed in Cannon Beach. With relatives visiting from Georgia, we wanted their stay to be the essence of the Oregon coast, so we chose this cottage. It was just what we hoped it would be. We were in walking distance to town and the beach, and the house itself was a great place to relax and visit around the table. The yard was beautiful - full of hydrangeas. We left with wonderful memories of our time there." "We had a great week and are coming back next year." 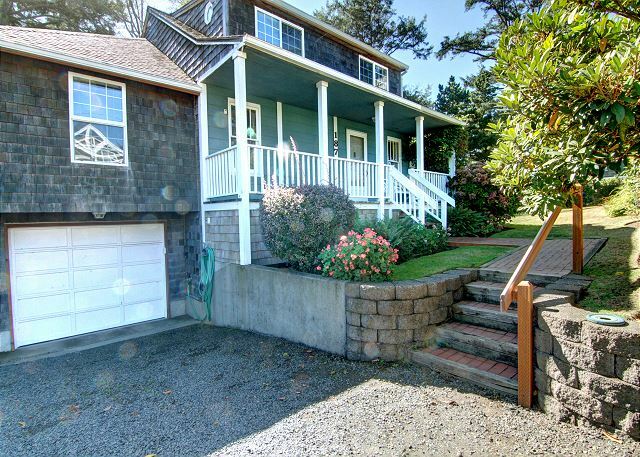 "We've rented a few houses in Cannon Beach, and this one was our favorite. It's an older house, but very well updated, and very well built (soundproof). It was a very cozy house, and we enjoyed the gas fireplace during our somewhat cool stay. We would definitely love to stay here again." "We were very pleased with this lovely home located one block from the beach and two blocks from town. The living room and dining room were much larger than shown in the pictures. Also, the kitchen eating area was roomy enough for 6. The house was very clean and in good shape. And, as usual, CBPM was wonderful to deal with. This was our 14th year working with them." "McRae is a very cute house in a great location. However, the furniture wasn't very comfortable for relaxing, esp. the couch, the dining chairs and the downstairs queen mattress. The yard is lovely, and an outdoor seating area would be great!" "The house was charming and comfortable. We LOVED the kitchen! It was wonderful to be close to the beach and the shopping area." "We love the McRae House. Its large common areas work well for us. The upstairs is quite charming, but works best for short people! Thanks for a wonderful stay." beach and town (which we needed). Wish we had been able to stay a few more days." "Beautiful home well taken care of. Excellent location. The only thing that was challenging was that there was no bathroom on the upper level, which is where 2 of the bedrooms are. There were too full baths on the main level though -- just poor water pressure in one of them, so our entire group ended up sharing 1 bathroom for showers." "This is the second time we have stayed at this home. It is so quaint, plenty of room. Also you can not beat the location, so close to town and the ocean. For the Sandcastle Building Event all we had to do was walk a block to the beach and the event!!! Love this place." "Great house for 4 adults and two grandchildren. 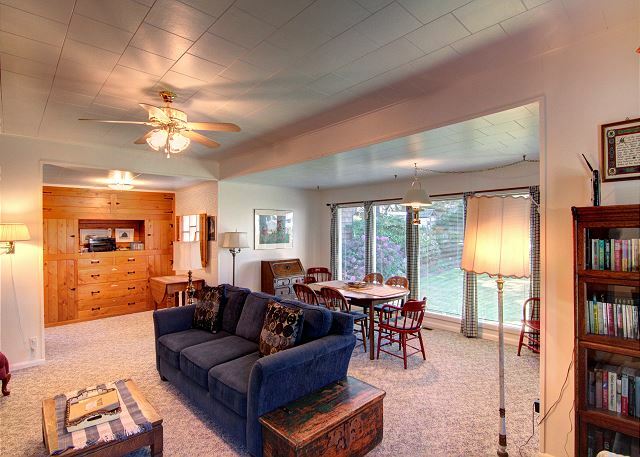 Location very handy to beach and downtown Cannon Beach." "Cute house! Great location for my family...we parked the car and walked everywhere! The house had everything we needed to make our vacation very easy and fun. I will rent this home again." "The MacRae House is a great place to stay, we would stay there again! The location is unbeatable, a couple short blocks to town and the beach (very quiet considering its proximity to downtown). The house is located on a quiet street surrounded by other charming houses. The yard is very pretty, we enjoyed sitting out in the sun (when it came out). The house has lots of sleeping options and a very well equiped kitchen. What we liked best about the house: the yard, the kitchen, the LOCATION, the neighborhood, the gas fireplace, the antiques that give it a great feel. What could be improved: downtstairs bed was too soft, the couch in the living room is pretty worn out. Small draw backs to an otherwise great place to stay. 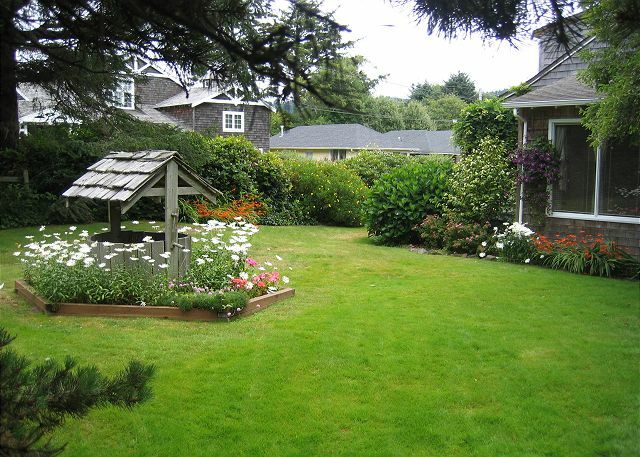 I would describe the MacRae house as an authentic Cannon Beach Cottage with lots of room in the best area of Cannon Beach." "We loved the house and everything about it...from the "twin's bedroom" to the musty old basement with the rusting bicycles. We sometimes communicated by the "upstairs-downstairs telephone", (the floor grate)and played Scrabble at the games table with the fireplace on. The kitchen accommodated all four cooks at once and had all the equipment we needed and more. We could hear the ocean and walk easily to our cooking class at the end of the street and to the theatre to see "Clue". The bedrooms were comfortable with lots of hangers in the closet to accommodate the wedding attire and all the shopping we did. At the end of our wonderful 14 days we stood around the wishing well and wished that we could come back again." "The property was very convenient to town and the beach. The layout of the house provide a space for everyone. The kitchen was great! We love to cook and it was an excellent space for meal preparation and mingling. We would definitely stay there again." "Our family thoroughly enjoyed our stay at the McRae House. It's design and layout perfectly met our needs, and it contained everything we needed. Also, it's location placed us conveniently close to both the beach and downtown Cannon Beach. We look forward to staying there again! " "Property was better than it appeared in pictures. Kitchen was spacious and good for the family gathering in the morning. Fireplace was great. Stairs to 2nd floor were narrow and steep. Everything was fully stocked - kitchen stuff, games, etc. Not much in the bathrooms - soap, shampoo, etc. Great house. Will definitely stay again." 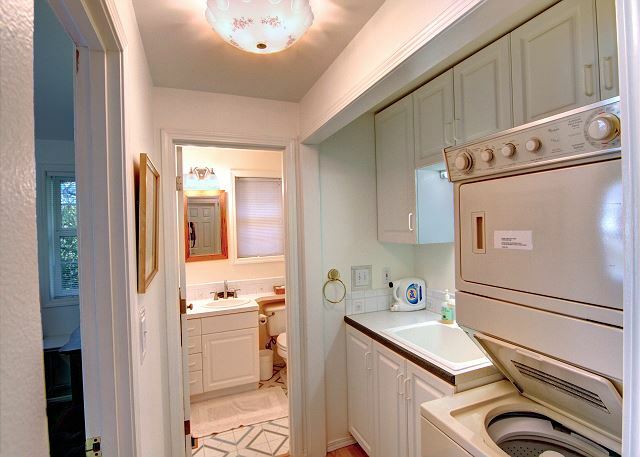 "This charming home is very well equipped. Everything we needed was available to us. We enjoyed easy access to the beach and the village; and, the yard is beautiful! The steep staircase to the second floor bedrooms made it difficult for some in our family and the living room furniture needs some upgrading. Overall, we would recommend it to others looking for a charming environment in a good location." "The McCrae home was absolutely perfect!!! It was so homey that in less than an hour we had all set ourselves up in our individual rooms and the kitchen was ready to begin a meal. Our greatest worry was that we had so integrated into the house that we might leave something behind. Close enough to hear and smell the ocean but protected from the wind and downtown is but minutes away." "This was a spectacular place to vacation in Cannon Beach! The location could not have been better...convenient to both the beach and downtown. Wonderful kitchen, comfortable bedrooms. The yard was adorable. The only wish was for a deck, so we could enjoy the outside even more! We truly had a wonderful stay." "We had a fabulous time here. Everything was in very good order and the location was perfect. The only concern was the "mustiness" of the house when we first arrived. Also the basement continued to have a very musty odor. Given that this was an old house I'm not sure what could be done about it and it would not prevent us from returning and enjoying another vacation there!"